How does one start their New Year? Most people would be busy listing their New Year’s Resolutions – things that they promise to do better (or start/stop doing) this year. I used to do that, too, but not anymore this year. I don’t want to promise doing things but then eventually fail in keeping them – I don’t make promises I can’t keep. This year, I’d rather want to try. Try living what they call a Bucket List Life. I want 2015 to be a Bucketful List Year. I want to try many things this year and I have an in-progress list of the things I have never tried before that I’d want to start doing now. – Leave an origami (write a note inside) at a random place and hope that it could make someone’s day when found. – Try Muay Thai at least once in my life time. See? I just started listing. I actually have an existing list of things I want to do before I hit the bucket, it’s just that this time, I’d like to list them one by one as I achieve it or as I first thought of it. Surprisingly, for the first time I enjoyed my own company. 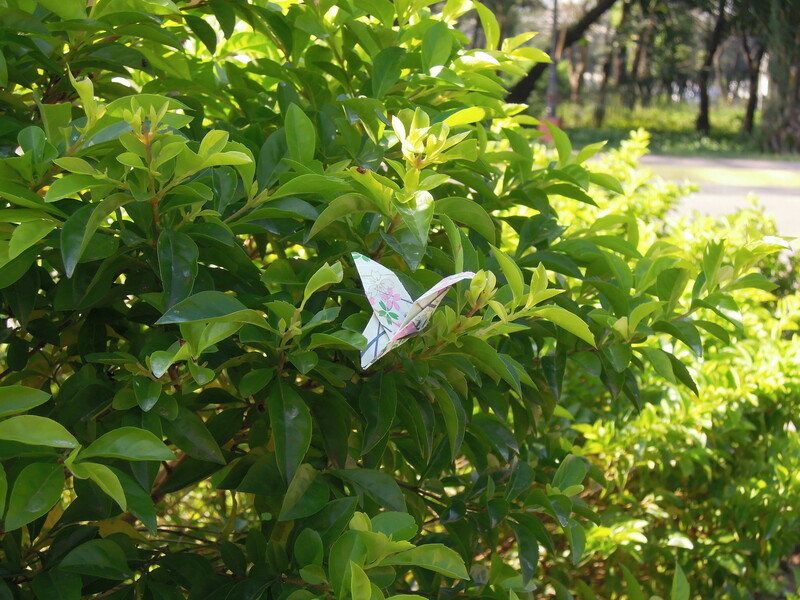 After finishing my morning run, I found a spot and left one origami that I brought with me to the park. I wrote a note inside this butterfly wishing anyone (who would see and pick it up) a nice day. I hope I was really able to make that person smile. I hope that he/she did not think that I was only adding up trashes. And this serves as my official start to the New Year. No DOs and DON’Ts. No Start/Stop resolutions. Posted on January 9, 2015 October 27, 2017 by JokelPosted in Written WordsTagged bucket list, first step, start.